Some Lower Main Street traders are seeking a rates suspension, claiming trade has been significantly disrupted by public realm work. Car parking outside businesses in the lower Main Street area has been removed, while elevated wooden pedestrian access bridges have been installed at the entrances to several businesses while work is carried out on the pavement below. Owner of the Silver Lounge Cafe, Wendy Hamilton, told the Times that the work has had a negative effect on her business. “The work has been going on outside our cafe since July. First it was water, then the electric and now the pavements,” she said. “It’s worse with the pavements. We would have a lot of elderly clients who find it difficult to get in. “Everybody in the town is going to be affected by this. “Customer numbers and takings are down and the summer is usually a busy time to do more trade before winter. Wendy says that contractors have been keeping businesses informed of their progress, but feels that the work should have been carried out in the quieter trading period of winter. She also believes that carrying out the work at night would prove less disruptive. Carriages Bistro owner Ignatius McAlonan said he believed the rates of businesses should be suspended for as long as they are affected by the project. “There is no promise for compensation in any public works, but I don’t think we should be paying rates. They should be suspended,” he added. “We aren’t even getting access to our premises. It’s right outside our front door and from next Wednesday it will be on our side of the street. 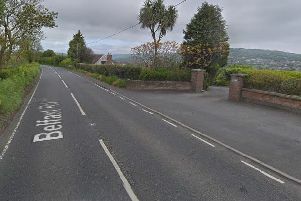 Owner of Larne Computers, David McFadden, estimated that his trade had dropped by 30-40 per cent during the public realm work period. “People won’t walk down here and if they have a big computer they won’t come in,” he explained. Andrew Faulkner, who opened the Just Active gym in February, said his new business is “finding it hard” due to the public realm work. “Since this happened, trade has just plummeted,” he revealed. However, some business owners said they felt the temporary disruption was worth it for the long-term gain. Owner of Robinson’s Furniture and Gifts, Michael Robinson, commented: “I haven’t seen a big reduction in business. It would be different if they were closing the road off. Chair of Larne Traders’ Forum, John Shannon, said he sympathised with the traders’ predicaments, but he felt their pleas for a rates suspension were likely to be refused by the Rates Collection Agency. “I totally sympathise with them, but public realm work takes place all over the UK and Province and no local council has ever reduced rates in that time,” said John. Mr Shannon has complained to Mid and East Antrim Borough Council about temporary measures provided by utilities, saying “pieces of old board or an old sheet of rickety steel” was not acceptable. He added, however, that he also feels the contractors “can’t win”. “They are doing their best, but no matter how well and quickly they do it there will still be disruption to trade, which will go down, but in the long term it will be better and attract more business,” he concluded. There will be breaks during the Christmas trading period. “Neither Mid and East Antrim Borough Council nor the Department for Social Development (who are part funding the Public Realm Improvement scheme) pay compensation for alleged decreases in trade while such works are taking place. Council will continue to work with local businesses to minimise disruption during the works,” she concluded.